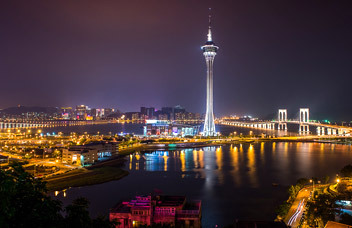 If you have a chance to visit Macau, do not forget to go to Macau Tower, an important landmark of the city. It was designed by Gordon Moller, a famous architect of New Zealand. The construction was finished in December, 2001, at the 2nd year anniversary of Macau's return. It was the eighth highest tower in Asia and the tenth in the world by the year of its completion. Besides, it is a member of the World Federation of Great Towers. It is such a charming place attracting more than 1 million people to visit in a year in different ways. Sightseeing Observation Macau Tower is 338 meters (about 1,108 feet) above the ground. The highest observation level is the Outdoor Observation Deck on Level 61, with a height of 223 meters (about 732 feet). Walking around the Observation Deck, You can have a panoramic view of the Peal River Delta, Macau Peninsula and Taipa, Coloane islands. The Observation Lounge is on Level 58. It is a fascinating place to see the sunrise in the morning or see the spectacular night-view of Macau. Looking down, you can see the East and west Mangyang Hill, Casino Lisboa and even the outlying island of Hong Kong in sunny days. Besides the tower, there are 4-floor convention and entertainment centre, restaurants, cinema, a 2-level basement and an outdoor plaza. Conference & Entertainment Function The Conference Center has good facilities for all kinds of international conferences, seminars and art performances, meetings and some private occasions. The Exhibition Hall (on Level 2) has about 100 exhibition booths, and it is suitable for trade fairs and all kinds of exhibitions. The Grand Hall (on Level 4) contains 8 rooms for different function. The open terrace of the Grand Hall is a good choice to hold cocktail parties and home gatherings. In the theater on the 4th floor of the tower, you can watch upcoming movies. The auditorium has 500 seats, and simultaneous interpretation facilities provide three languages translation. The multifunctional hall equipped with advanced lighting and audio–visual facilities. Private VIP Tiger Slot booth is available. Adventures Mast Climb: Standing at a height of 100 meters (about 328 feet), you can climb up to the top of the tower. At that time, you are at the highest point of Macau it will be another your special memory because what you see at here is a complete different scene. Bungee Jump: Maybe you have played bungee jump several times, but this is the highest one in the world. 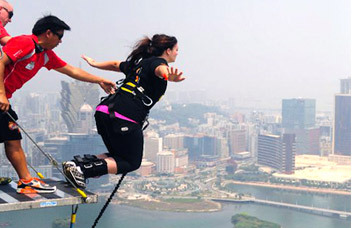 Jumping up and down about 223 meters (about 732 feet), you have the chance to renew the Guinness record. Skywalk X (on Level 61): Walking on the out rim 223 meters (about 732 feet) above the ground, and no handrail is provided. This is another special experience in Macau Tower.